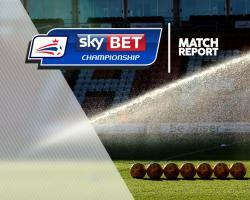 Norwich squandered a string of chances as they were held to a goalless draw at Brentford in the Sky Bet Championship. Cameron Jerome was the biggest culprit as the Canaries kept only their second clean sheet on their travels in 33 games but that statistic was rarely in doubt against a Brentford side that failed to muster a single effort on target. Even after City midfielder Robbie Brady was sent off for a reckless sliding tackle on Ryan Woods with 10 minutes remaining, the Bees lacked any real cutting edge. Their leading scorer Scott Hogan came closest to snatching the points for the hosts in their most incisive move of the game, but was thwarted by a brilliant last-ditch Ryan Bennett tackle as he was about to pull the trigger. Norwich looked the more threatening of the two sides throughout, but an out-of-sorts Jerome was firing blanks all night. He should have done better after just five minutes when he got across Brentford defender Harlee Dean only to glance his header straight at goalkeeper Daniel Bentley. The Londoners' first real chance came on 12 minutes but Sullay Kaikai's side-footed effort from a Maxime Colin break lacked any real conviction and bobbled through to John Ruddy. Crystal Palace loanee Kaikai came closer on 17 minutes when he burst towards goal after a well-worked short-corner but saw his low drive deflected wide by Nelson Oliveira. City's best chance in a cat-and-mouse first half came on the half-hour when Brady outpaced Ryan Woods down the left and squared the ball for Jerome at the far post, where the big striker failed to meet it. Jerome should have done better just before the break after racing onto a superb Brady ball from deep, but shinned his shot straight at Bentley. Brentford failed to find top-scorer Hogan with any worthwhile supply, his first sight of goal coming after 43 minutes when he flashed a shot high and wide from 12 yards. Kaikai should have done better just before the hour after surging into the box, again from a short-corner, but his cross shot was far too heavy. Oliveira flashed an angled drive past the far-post minutes later as both sides struggled to forge any clear-cut sights on goal. Kaikai was again at the heart of things after 68 minutes, his whipped free kick finding John Egan at the far post but his header was blocked by Ruddy. Seconds later Jerome again went close at the other end, this time failing to connect well enough as his low-angled drive skidded across the face of goal. But Jerome's worst miss came after 72 minutes when he skied the best chance of the game with Brentford caught hopelessly square at the back and Ivo Pinto laid a chance on a plate. Substitute Jacob Murphy linked well with Jerome within a minute of coming on to force Bentley into a brave save as Norwich turned the screw until Brady's straight red. Martin Ollson forced a late block from Bentley as the Canaries looked to strike on the break, but in the end under-fire manager Alex Neil had to settle for a point and a vastly-improved performance.